Editor’s note: Continuing our exploration of how Facebook could eat Google’s lunch, guest author Hussein Fazal makes the case for Facebook’s potential advantage in advertising. Fazal is CEO of AdParlor, an ad management and technology company for Facebook campaigns. Not too long ago—the common perception was that Facebook advertising did not work. Why would a user notice an advertisement with a small image discretely tucked away in the right-hand column? In fact, most users were building up their “banner blindness,” and ignoring the right-hand column altogether. However, much regarding Facebook ads has changed since then. Changes in profile design encouraged users to provide more complete information and advertisers became educated in the value of hyper-targeting. Facebook’s ad serving algorithm improved dramatically and the launch of the Ads API allowed for an additional layer of intelligence to be built on top of that. 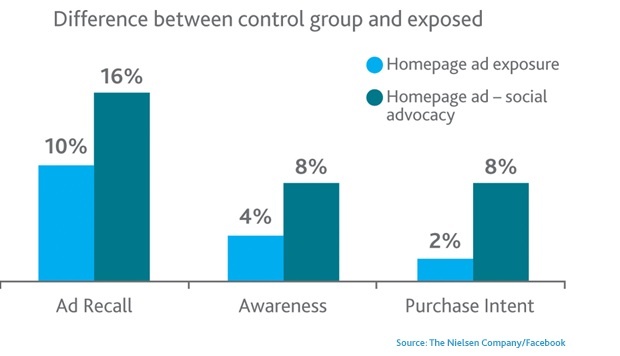 Gradually, right-hand column marketplace ads became more effective for all types of advertisers—while Facebook concurrently grew its sales team to push out premium ads to brands and agencies. 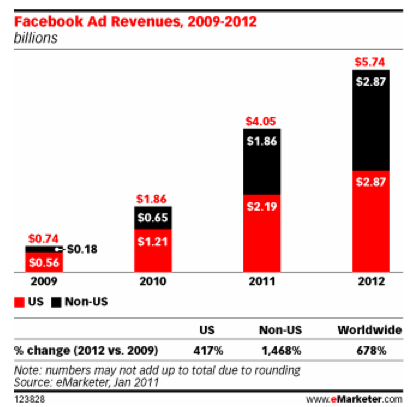 With all this progress, eMarketer estimated Facebook’s ad revenues at almost $2 Billion in 2010 and over $4 Billion in 2011. Despite all this success, Facebook’s revenues are still far behind the search giant, and claiming that they will surpass Google is a bold statement. However, there is a very clear path for this to happen and it is simply a question of when. 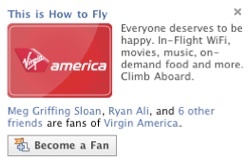 The timeline will be dependent on how aggressively Facebook executes on their advertising products. The fundamental reason why I believe Facebook’s revenues will surpass Google is the untapped power of social advertising. The concept that your friend “likes” and endorses the content behind a particular ad unit changes the game. When looking at online advertising revenues as a whole, the IAB reports that roughly a quarter come from display. With over 2.5 million web sites having integrated with Facebook Connect and 10,000 new ones joining daily, Facebook is building up a huge network of external web sites with deep Facebook integration. The opportunity for these sites to display advertising that melds contextual and social is a stone’s throw away, and something that Facebook can aggressively turn on if it so chooses. To take things further, as “like” buttons become ubiquitous across the web, user profiles are growing with data on what they do, buy, and endorse. While Google and others leverage re-targeting, Facebook will be able to take it one step further with social re-targeting. If my significant-other visits Nordstrom.com and “likes” a pair of boots, that advertisement could now follow both of us around the web. Every few years, a new layer is built on top of traditional display advertising (contextual, behavioural, re-targeting) but we haven’t seen innovation in quite some time. Social will be the next fundamental change, and Facebook is positioned to take advantage of it. The same IAB report shows that roughly 45% of online advertising revenues come from search. The reason why search is so much more powerful than any other medium is because it targets users that have explicit purchase intent. For example, if I search for “car insurance,” I have a very real interest in making a high value purchase. Insurance providers pay big dollars to Google for these clicks knowing that they have a good chance of converting that user into a sale. Alongside Facebook’s deeper integration with Bing, it is inevitable that at some point we will see advertising that combines the power of intent-based search with social recommendations. However, this will be dependent on how much users are willing to share and “like.” Perhaps aggressive campaigns by car insurance providers (“Get $100 off your premium if you ‘like’ us on Facebook”) will allow us to one day search for car insurance, and see which provider each one of our friends is with. This will undoubtedly be more powerful than traditional search. Even with this layer of social, in order to be successful, search market share must be won. With Facebook’s social graph, they have the first real opportunity at dethroning Google and winning that market share. Whether Microsoft ends up selling their money-losing search business to Facebook as a starting point, or whether Facebook builds an independent search product from the ground-up, this is where the biggest impact will be made in increasing Facebook’s advertising revenues relative to Google. With over 250 Million active users accessing Facebook via their mobile device, Facebook is building up an audience on the hottest emerging platform. With free and popular iPhone, Blackberry, and Android apps available, Facebook has yet to serve up a single advertisement on mobile and doesn’t seem to be in a rush. However, things may be changing with a small but targeted recent acquisition. It will require some work to figure out the right format, but again Facebook is at a huge advantage with the user base it has and the social graph that connects these users. The U.S. local online ad spend is estimated at $20 Billion – which is why Google was so interested in Groupon. Now combine local with mobile and social—and you have the blueprint to build a money-spitting machine. Facebook could theoretically serve you an advertisement like this directly on your phone—“You and your good friend John are a block away from each other, you both like Pizza and its lunch time, go to Pizza Hut together and save $5 on your order”—of course with less words and more pretty pictures. Now that the mobile advertising dollars are finally starting to materialize, we still have not seen the hockey-stick curve that we all expected. This will occur when more innovative mobile ad products are built out—and again, Facebook is at a massive advantage. When Facebook’s VP of Global Marketing Carolyn Everson said at Disrupt NYC, “We’re one percent done on our ad products,” it may not be an exaggeration. Ads that live within the Facebook site really are the beginning of where things can go. As Facebook gears up for an IPO, expanding its portfolio of advertising products through display, search, and mobile will change the landscape in each one of these areas. It becomes even more impactful when we think about how these different products can work together connected through the social graph. While many people think about Facebook as a powerhouse due to the number of users on the site, the real power comes with the way they are mapping users to their friends and the products, people, and places that they “like.” When Facebook decides to turn up the revenue dial, they will be able to leverage this graph and create powerful social ads across multiple platforms to a degree of scale and sophistication that no other company can match. As these products develop, Facebook will command the lion’s share of online advertising dollars—and they will undoubtedly surpass Google.